Hi All, Christmas is coming, the coaching team are on a well-deserved break, so the next coach-organised mixin will be Sat 6 Jan. Courts are still booked out for sat, sun and tues mixins on a self-organised basis so feel free to come down and use them. And there's plenty of court space for a holiday hit, the courts are open every day. We’ll be running our traditional fun New Years Day American Tournament on (surprise, surprise) Mon 1 Jan, from 1045 for an 11am start, sign up free on the website here to be sure of a place - there may be some spots on the day but it’s a popular event and we have sometimes had to turn people away. With thanks in advance for offers to organise from Julian and Phil. Hangovers expected and encouraged, there’ll be coffee and nibbles on hand, the bar’s open, and the squash and croquet club are laying on sausage and mash afterwards for both players and non-players for £5 a head from about 1pm. How it works: It's a fun mixed doubles tournament – you get allocated a partner at random at the start, play a short set, then rotate around to play with a different partner, we keep track of the overall scores and there are novelty prizes. Can't work out how to sign up? Use your court booking login or register new if you can't remember it, the technically challenged may email Harold but I'll be offline for xmas so safer to do yourself if you can. Snow: please DON'T sweep snow off the clay court as it just bunches up the clay, the makers say you can remove snow by hand (huh? ), otherwise just wait for it to thaw. 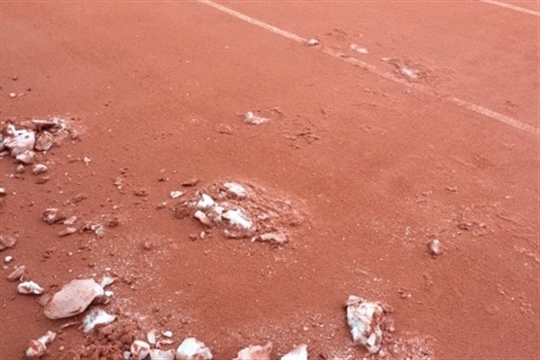 Hard courts you can sweep carefully but watch out for ice underneath. Frost: okay to use the clay court as long as it's not slippery; hard courts don't use until the frost is thawed and footing is sound. Ice: don't use any courts, it's just not safe. Have a great christmas and look forward to a tennisy new year.